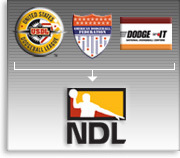 theNDL.com :: The official home of the National Dodgeball League and professional dodgeball. Who's Top Dog In Sudbury? Which team was the big star in Dallas? Who reached the top in Seattle?